Some of the more memorable moments from a vacation trip that involves sightseeing seem to take place when you take a chance and experience something unexpected or quirky, perhaps something that is different and unique, something that tickles your brain cells in a manner that you are not expecting. And so it was with our visit to the Longstreet Inn and Casino in Nevada. We were on a week long vacation, part of which involved a drive down the east side of the Sierra Nevada mountain range from Reno, NV, to Death Valley in California. We were spending two days in Death Valley, noted to be the largest National Park in the United States outside of Alaska (more about the experience of Death Valley in a separate blog). It was towards the end of our first day exploring Death Valley, and the sun was setting as we turned onto the road that would get us to Amargosa Valley in the south. We were headed for the hotel we were using for our stay in that area. A half-hour drive out of the park through quickly darkening skies got us to the T-junction at Death Valley Junction at the end of California’s Route 190. We turned left at this point and headed further east towards the border with Nevada. As we drove through the emptiness of the now dark western evening, we started thinking more about our final destination for the day. We were trying to figure out how much longer we needed to drive to get to Amargosa Valley and our hotel. We could not get our GPS device to recognize the address that we had for the place. There was nothing of interest by the roadside and no landmarks that we could use to guide us on. We arrived at the border of California and Nevada about seven miles down the road. We saw some bright lights ahead of us to left side of the road. There is nothing else in sight. As we got closer we noticed the flashing neon lights advertising an inn and the casino. It was our destination! The location of the town of Amargaso Valley was still many miles away according to our navigation tools. Apparently our destination was on the “outskirts” of the town, in the middle of nowhere. I entered the building through the door leading to the casino. It felt like I had entered a strange place. The lighting and decor was a little off. In front of me was a mannequin of a man on a motorcycle. He appeared to be wearing sunglasses. Off to the right I could see and hear the slot machines of the casino. There were people sitting in front of some of the machines, seemingly staring at them blankly, lost in their own world. Off to the left was a restaurant, Jack’s Cafe, and and next to it, separated by a passageway that led to the hotel rooms, a counter behind which lay a convenience store. In front of me was a bar that did not look too busy. There were little antique statues and doodads around the place that looked like they were from the 50s. I must have stepped into a time machine and landed in a far away time and place. Some other folks who were checking into the hotel asked for the nearest gas station and were told that they needed to drive 17 miles down the road into town to get to one. We also ran into some folks who were staying at the Amargosa Opera House and Hotel, another otherworldly establishment down the road at Death Valley Junction. Apparently the restaurant at our hotel was the only place to get dinner at for miles around! Our hotel room was comfortable enough, but it also had a somewhat worn out and dated feel to it. The soap and shampoo that they supplied were quite basic and they had not bothered to give us enough towels. The wifi signal was poor (and the internet connection finally stopped working on the second night). The commode was leaking slowly and the flush going off every few seconds. (It never got fixed during our stay!) But we had to take all of this in stride and in the right spirit. We were in the middle of nowhere. In a way it was also a part of the holiday experience. The restaurant itself had a well-used air to it. The carpeting and seating, and the menu items, were typical Americana. The pace of service was slow. The two young Hispanic girls who were serving us had a pleasant and unhurried air about them. I could not help thinking that these youngsters must have traveled a long distance to get to work. I wondered how close their school was to where they lived. We enjoyed our drinks while waiting for the food, trying to be patient, listening to the sound of the slot machines in the background from the casino close by. There was the faint odor of stale cigarette smoke hanging in the air. Once in a while, folks from some of the other tables in the restaurant would get up and walk to the bar to get more drinks to consume while they waited for their food. When dinner finally arrived we all dug in with gusto. It was standard American grub, but it was quite tasty. Our wait had been rewarded! The next morning, I stepped out of the hotel to get a better look at the lay of the land. We were indeed in the middle of nowhere. There were mountains off to the north, and one could see the trailer park where you could rent some place for your trailer instead of getting a room in the hotel for the night. The border of the two states was within walking distance of the hotel. On the second day of our stay in Death Valley we decided to have dinner at a resort in the park itself in order to avoid the slow process at the restaurant in the hotel. After dinner, we drove through the dark and arrived somewhat late at the hotel. We went straight up to our room to chill out and get some rest. We left our hotel very early the next morning since we had a long ride ahead of us that day. The sun was rising rapidly across the plains and over the distant hills to our east, and beginning to light up the mountains to the west. 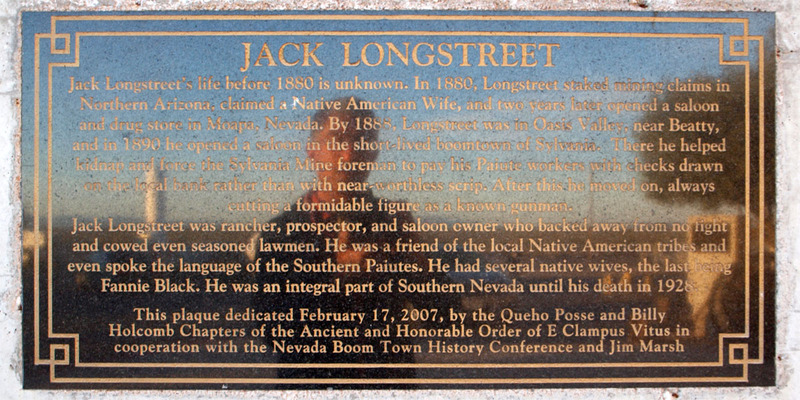 On our way out of the hotel after checking out, I stopped to take the following picture of a plaque that talked about Jack Longstreet (click on the picture to expand it). He appears to have been an interesting character from the wild west. Perhaps I will read a little more about him. Our stay at the Longstreet Casino and Inn was a unique experience. I enjoyed the visit back to a different time and place, to a place in the desert where things appear to move at a different pace, a world where people probably have a very different way of life than people in the cities and towns, a place where life is in all likelihood somewhat harder than ours. Experiences like this help you further appreciate the diversity of people and experiences that build up this land. Everyone has their own story.